My first real experience with eating puff pastry came years ago while traveling in Europe. One day while going about my business I happened across a quaint little pastry shop that beckoned me in while it stretched forth invisible permanent tentacles ensnarling my senses. That day changed me and opened my eyes, nose, taste buds, and pallet to a new way of looking at food. Before that point I had mostly viewed food as just something you ate to keep you from being hungry, not something that should be enjoyed. This little shop taught me to start enjoying food in new ways. Food should be good, good for you, but it should also look and smell wonderful and have excellent texture. So how does puff pastry fit in to all of this? 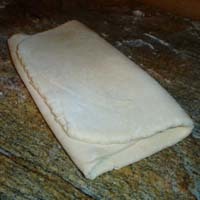 Well puff pastry dough is a light and flaky dough that can be used for both pastries as well as main dishes. 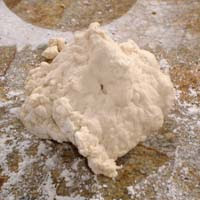 This dough gives a depth of complexity to the flavors and pallet that can not be easily replaced. On top of this, you can do amazing dough art with puff pastry. 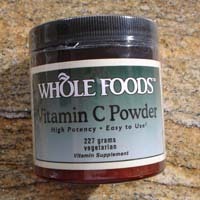 So why do more people not cook with it? On the surface it appears to be difficult and complex to make, however, neither is true. The key to puff pastry is technique and a little bit of patience, plain and simple. You can do a lot of neat artsy things with puff pastry to make your creations beautiful. This first post is to work through the basics of the dough and I will be building some simple puff pastry turnovers, nothing ornate just simple wonderful things to eat. Now before we get started there are a few key things to always remember. Heat in the form of room temperature or from friction/viscosity (from working with the dough) is EVIL. Do not get impatient, this will take several short blocks of time and can be spread over the course of a day or two days. Follow the technique outlined below; if you try to improvise it will fail. 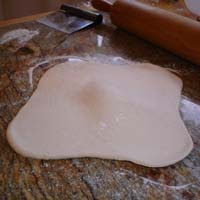 If at all possible work your dough on a marble slab as it will help keep the dough cooler. When working with the dough and butter, you want to minimize the amount of time it is out of the refrigerator therefore move quick and do not let the dough sit idle. - Add 180 ml of cold water, sifted flour, salt, and ascorbic acid powder to your food processor to mix. Make sure you are using the dough blade and have the food processor set for mixing dough. Do not try to use a stand mixer with a dough hook it will not mix it well enough. - Mix in the food processor for about 15 seconds or so. Then scrape the bowl and mix for another 30 seconds or until a nice dough ball is formed. 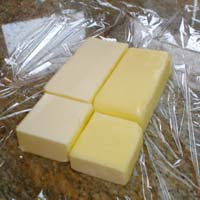 - Place the butter in the back of the refrigerator for 30 minutes or until nice and firm. 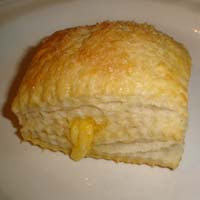 - Take dough ball out of the refrigerator and roll out a cross with a “mound” in the middle. 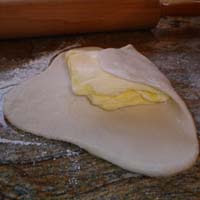 - Place the butter on top of the mound and then fold up the sides of the dough to cover. 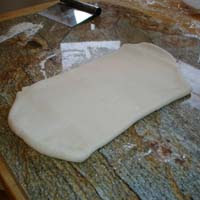 - With your rolling pin, push down and roll to form a nice rectangle. 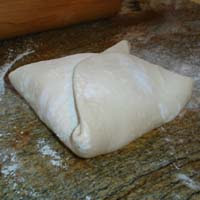 Fold this in thirds, turn the dough 90 degrees, and push down and roll once again in to a nice rectangle. Fold it back together in thirds, wrap in plastic and put in the back of your refrigerator for at least one hour. What you just did was perform one set of two turns out of the three sets that you need to do. You will be rolling and folding a total of 6 times before you roll out to cut. 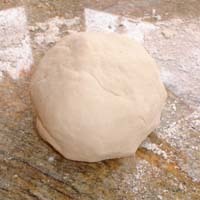 Between each set you need to let the dough rest for at least one hour in the refrigerator. - After you are finished with all of your turns, cool the dough one last time for an hour. 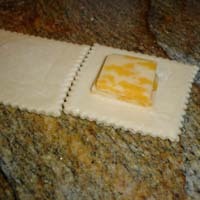 Then cut in half, put half back in the refrigerator (wrapped in plastic as always) and then roll out the remaining dough so you can cut it in to the desired shapes, in our case large squares. - Wet the inside edges of each square with a little bit of water, this will help it stick together once you put the pieces on top of each other. 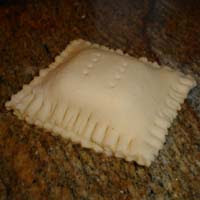 Place your desired filling in the middle and cover. (If you do not plan on using a filling that just use one square, do not double them up without a filling). Use a fork to press and seal the seam and carefully spear the top with the fork to provide a vent. 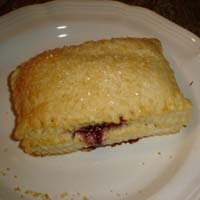 - Place turnovers on a cookie sheet, brush the tops with the egg wash, and dust with some sugar in the raw (Depending on the filling I also like to sprinkle some cinnamon on top of these simple puff pastry turnovers). - Bake at 375 degrees for 30 minutes.